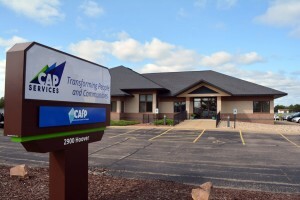 CAP Services reaches capital campaign goal with big assist from Delta Dental of Wisconsin – CAP Services Inc.
CAP Services recently reached its $300,000 capital campaign goal for its 2900 Hoover Road location in Stevens Point. Delta Dental of Wisconsin accounted for $60,000 of the total raised, $10,000 of which came through a matching gift. Delta Dental matched 50 cents of every dollar raised for CAP’s capital campaign from May 15 through August 15 up to $10,000. CAP raised just over $45,000 during the challenge, which combined with the match to put it over its goal. CAP’s Hoover Road location opened in June 2017. It houses the corporate and early childhood education administrative staff previously located on Highway 10 East, as well as business and auto lending staff previously located at CAP’s Program Office on West River Drive. The cost of the building was paid through the sale of property and the capital campaign. Major capital campaign donors include Delta Dental of Wisconsin; Victor and Christine Anthony; Dale & Annette Schuh; Great Lakes Higher Education Guaranty Corp.; Seramur Family Foundation; Scaffidi Motors; Theda & Tamblin Clark Smith Family Foundation; Mary and Bob Berard; Edward J. Okray Foundation; Peters Family Foundation; Simplicity Credit Union; Worth Company; Mary Patoka and Dave Onan; Pointe Precision; Heartland Farms; Skyward; Sentry Insurance Foundation; Tim Copps; Kwik Trip; Ellis Construction Company; Wisconsin Public Service Foundation; Antioch Foundation; Ann and Bob Shannon; Patty and John Noel; John Gusmer; Marshfield Clinic Health Systems; Associated Bank; Bank First; Donaldson; Investors Community Bank; Brett and Darcy Jarman; Bull’s Eye Credit Union; Mark and Tina Arend; Steel King Industries; Marg Coker-Nelson; Jim and Cathy Martin; Krause Foundation; River Cities Bank; Laura West; and International Bank of Amherst. Jeff and Joan Budelier; Deb and Marc Wolding; Bushman Electric Crane & Sign; and Resource One Installation & Service made significant in-kind donations to support the move to the building, new equipment and other needs. In 2017, CAP programs reached nearly 2,700 households with over 9,500 members. Those services resulted in people getting better jobs; securing more reliable transportation to get to work; accessing affordable housing; starting and expanding businesses; finding safe shelter and emotional support; strengthening their families and more.